Newly built in 2001 to the highest of standards Corrimony exudes quality and charm throughout and sets you at the very heart of an area unrivalled in the whole of Scotland for exploring the natural beauty fascinating history and extensive attractions which all lie within half an hours drive of your front door. Corrimony is set in the middle of a traditional crofting area ( skye of curr ) Dulnain bridge, its location places you in the centre of a triangle of charming villages Carr-bridge 7 miles, Nethy bridge 3 miles , Boat of Garten 7 miles and the town of Grantown-on-spey with its fine selection of shops restaurants and bars being only 3 miles from the property, Aviemore is 10 miles away and Inverness with all its attractions museams, cinemas, ten pin bowling, theatres, restaurants etc etc is only 30 miles away the speyside whisky trail is right on your door step and royal deeside and balamoral castle can be reached in about one hours drive to sum things up you can virtually reach any part of the north, west or east coasts of Scotland within two hours the location really is that central so you could never run out of worthwhile places to see and visit. Fully tiled bathroom with power shower downstairs with an additional spacious toilet and shower room upstairs making it ideal if the the house is to be shared by two families. Fantastic week. The house was wonderful, very clean with all amenities. We walked the woods behind the cottage and cycled the forrest around Grantown on Spey. Deer in the garden on first morning. A great base for touring the areas surrounding, and so many places and locations to visit. Brilliant.A big thankyou to Chris and family for use of your lovely property, David,Judith, Amanda and Richard. Wonderful house with great views towards the mountains. Spacious and comfortable for the 6 of us staying and very quiet. Lots of windows and French doors to open to allow the cool air to circulate in the warm weather we had. Spotlessly clean and on the whole, very well equipped. Plenty of parking - we had 3 cars. Nice lawned garden back and front and my grandchildren loved tray sledging down the short grassy slope at the back. Very well placed for visiting the whole area. Good grocery/food shops close by in Grantown-on-Spey and slightly further away in Aviemore. The Landmark Centre is only a few miles away too and was loved by my 2 under ten years old grandchildren. This was an extended family visit and we voted this house the best we have stayed in together over the past 8 years and would certainly hope to return in 2 years time. Fantastic property. Excellent level of accommodation in pristine condition. I can't thank Chris enough. Perfect house with lots to do all around. Outdoor activities nearby, opportunities for cycling, Landmark just a short drive away for family days out. Excellent for winter sports resorts also. The perfect holiday home close to everything you would need. A really spacious holiday house, well equipped with everything you need at hand. Very spacious,great location, would recommend to anyone,more than happy with the accommodation and area. If you're planning to be in Grantown on Spey, Aviemore, or Dulnain Bridge, this is a great place to stay. It is out of the way for Inverness but, smack in the middle of the Cairngorm National Park, is a great home base to explore the historical highlands. Set between Aviemore and Grantown on Spey, Dulnain Bridge is tiny and quaint. The house boasts 4 bedrooms, 2 down and 2 up. The 2 downstairs are both configured as King beds, the two upstairs are larger, with views of the countryside and mountains, and both boast twin beds. You will need a car in this location, though there is bus service. We walked along Skye of Curr road and noticed that the Speyside Garden centre is there with a small park for our young son, he enjoyed it, but it's not much for anyone over 5. In the other direction, you dead end onto A938 and there's not much other than a bus stop, a post office, and a garage. The owner is very nice and the house was meticulously clean, if sparsely furnished. They were generous with provision of blankets and pillows which we needed, being from Arizona the whistling winds the first few nights of our stay made it quite drafty. The house's few furnishings are good quality and it's convenient for a family, but it is not decked out. There are no linens (extra sheets) or towels whatsoever included in the rental. You can pay to let towels from the laundress for 3 pounds per week per set, which I thought was ... we packed our towels. The house had not a stitch of provisions in the kitchen. No salt, pepper, sugar, tea, or coffee. There weren't even basic condiments in the fridge: ketchup/mayo/mustard. It was about an additional 10 pounds to get all the basics, but fortunately the COOP in grantown on spey is open until 10. There are two baths, one up and one down. The twin beds are upstairs but the upstairs bath has only a shower. Odd for traveling with kids The main bath downstairs has a tub and it is HUGE. The radiators worked well and the house was warm except the front upstairs bedroom, fortunately we did not need to use it as our party was small. It was a fantastic home base. We explored the Highlands but always had a comfortable place to come back. The appliances are in great condition and fairly new, the dishwasher and washing machine are quiet --good as the kitchen is next to the master bedroom. Overall it was an amazing stay and I hope to visit the Highlands again. If we are in the area, we'd stay with Chris again unquestionably. 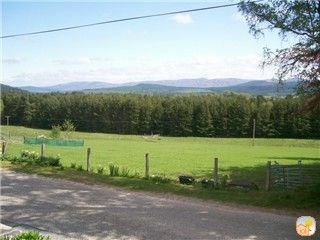 Other Activities: White water rafting, off road 4 x4 driving, Bird watching, Highland wildlife park, Strathspey steam railway, Cairngorm Furnicular railway. Arrival for clients will be any time after 3.30pm on the Saturday with departure by 10am the following Saturday a booking form with our standard terms and conditions of let will be sent out for completion to the person making the booking, a 25% deposit will be required to confirm a booking with the balance of 75% being due for payment eight weeks before the arrival date.